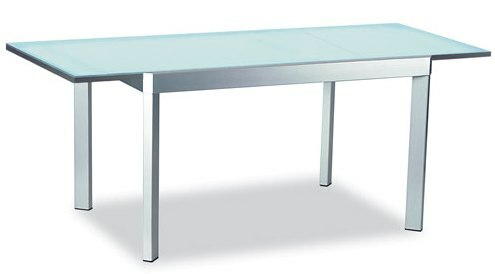 The Elasto extension table features a tempered frosted glass top and satin finished steel frame. Angled steel legs support 2 frosted glass pieces. When closed the leaf is hidden underneath the table-top. To create a larger table, simply slide the top to one side and the leaf moves along the same track. The Elasto dining table by Calligaris expands from 51" to a full 90" in length. Made in Italy. Extends from 51" to 90"